Connie is a member of The Church of Jesus Christ of Latter-day Saints (“Mormon” woman). The Relief Society of The Church of Jesus Christ of Latter-Day Saints (which church is often mistakenly referred to as the “Mormon Church”) is the women’s organization of the church. It was organized in 1842, by the Prophet Joseph Smith. The mission and purpose of the Relief Society is to increase faith and personal righteousness, strengthen families and homes, and seek out and help those in need. 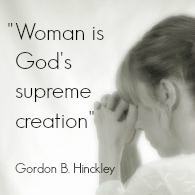 Being a member of the Relief Society as a Mormon woman has been a great blessing in my life. We meet together every Sunday to discuss the principles of the gospel of Christ. We meet at other times, usually once a month, to help and encourage each other in strengthening ourselves, our families, and the other members of our ward (the people in our local congregation). We provide service in our neighborhoods and communities; we also serve each other. The Relief Society has a visiting teaching program where the women visit with one another on a very individual basis to build friendships and encourage each other to live the gospel. Relief Society is a great boon to all members of The Church of Jesus Christ of Latter-Day Saints (or “Mormons”). Those of other faiths who wish to belong to this sisterhood of service are welcome and invited to attend. 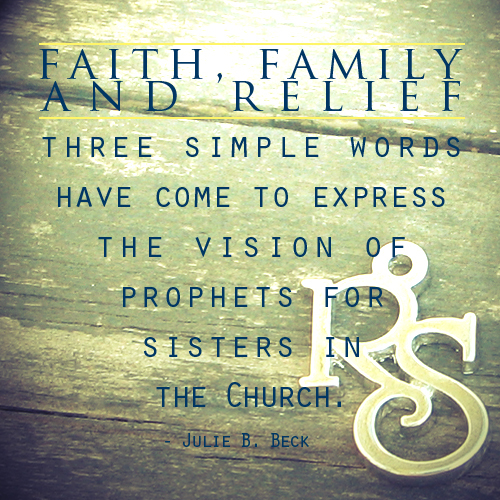 Learn more about the Relief Society.